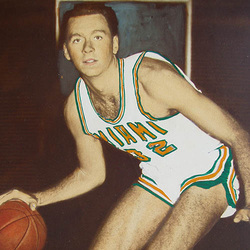 Wayne Beckner starred for the Hurricanes basketball team from 1962 to 1965, serving as team captain for both the 1963-64 and 1964-65 seasons. The 6-5 Flora, Indiana native finished his collegiate career with 960 points, 386 field goals made and 538 rebounds. Beckner made 83% of his free attempts, hitting on 106 of 128 shots in the '64-65 season. He connected on 18 field goal attempts against Tampa that same year. The rugged forward hauled down a career high 24 rebounds vs. Rollins in 1963, at the time, the 4th highest total by a Canes player. Beckner averaged 18.3 points per game and 8.3 rebounds per game for the 1964-65 season, combining with teammate and future NBA Hall of Fame member Rick Barry to lead the Hurricanes to a 22-4 record. In his 3 seasons, the Canes had a record of 65-16, winning at least 20 games each year, the only such stretch in school history. The '62-63 and '63-64 squads participated in the NIT Post season tournament. He is now president of Wayne C. Beckner and Associates, Inc., a sales firm representing the Herff Jones Company, a prominent ring manufacturer and maker of the UM Sports Hall of Fame rings. Wayne and his wife Vivian have three daughters and currently reside in Miami.